When you go through a divorce, there are a number of legal documents that need to be updated or changed altogether. Since the "two flesh" are no longer one, you are now in a situation where you are completely on your own. You have to look out for your own interests and those of your children in your estate planning. And if there are children in the mix, it's vitally important that you take care of these matters as soon as possible once the divorce is finalized. Dealing with all the details in a revamping of your estate planning post-divorce is a process. It's going to take several days or even weeks to put the correct legal documentation into place. So, don't get discouraged. Just keep plodding a long a few pieces of paperwork at a time until everything is done and in place. Last Will and Testament. Typically in a marriage, it's pretty rare that both a husband and wife will ever die together, unless it's in a freak car or airplane accident. So, if something should happen to one partner, the other partner normally takes over the affairs of the deceased husband or wife. Once a divorce takes place, though, this obviously changes everything. You no longer have that "built in" assistance in case of your untimely passing. So, in my updated will documents, I specified who would be the Trustee of my estate and then how my estate was going to be divided up. After the sale of personal property and then the value of my various life insurance policies, I have directed that my church receive 10% of my estate and then my two daughters receive the remaining 90% divided equal between them. Since my daughters are minor children, I had to specify that my Trustee invest and manage my daughters' share of my estate until they reach the age of 25, at which time they can have the remaining money from my estate. Durable Power of Attorney. This document appoints a representative to take care of legal matters for you in case you become disabled or incapacitated. Remember, if you are newly single and on your own as a result of a divorce, you really do need to have someone waiting in the wings to look out for your best interest if you become debilitated. Durable Power of Attorney for Health Care and Health Care Directive. Similar to Durable Power of Attorney, this document directs your Agent or representative to make health care decisions on your behalf if you become incapacitated. This is where you can tell your family to "pull the plug," so to speak, if you end up brain dead in a coma. You can also direct your agent to allow your organs to be donated upon your death. Beneficiary Forms. When I had to go back through my various investments and insurance policies post-divorce, I needed to outline who would be the new beneficiaries of my estate. 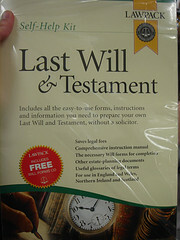 I needed my new forms to match up with the 10/45/45 percentages that I had listed in my Last Will and Testament. General Information Sheet. Once I had all the above documentation completed, I created a general information sheet for my Trustee which included the location of all my important paperwork, pass codes, and the contact information of the various people that would need to be contacted in case of my death. In a marriage, the typical thought process on estate planning is that one of the marriage partners will die before the other. Hopefully, you will share with your partner the important details of your family's estate and where all the important paperwork and information is stored. Once a divorce takes place, though, and you become a single parent, you need to line up people to assist you in the execution of your estate plan. An attorney. Although I have purchased self-service wills and estate planning documents and done these myself in the past, post-divorce, I wanted to be sure that my legal documents were more "official." So, I retained the services of the attorney who helped me through my divorce. I gave her some basic information that I wanted included in my estate plan, and then she produced the final documents within 4-5 days. A Trustee and a back-up Trustee. As you set-up your estate planning paperwork as a single parent, you will need to appoint someone (along with a back-up) to execute your will in the case of your untimely death. I recommend that you choose a family member you can trust, such as a financially responsible brother or sister who understands your desires for your estate money upon your death. If you don't have any siblings, then you might consider your parents or a trusted friend to assist you. Family. You should inform your immediate family of your desires concerning your estate and who you have appointed to be your Trustee and back-up Trustee. The Ex. Once I had all the important estate paperwork and people in place, I then contacted my ex-wife and informed her of the fact that I had updated all of my estate documents. I also gave her the name of my Executor or Trustee of my estate and his contact information in case of my demise. Once I had all my legal documents completed and in place, I made photocopies for my Trustee and handed those off to him along with a basic explanation of my desires if something should happen to me. I also took all the important original copies of my legal documents and placed those in a secure location. My Trustee was then informed of where and how to access this secure location. There is no guarantee that any of us will live to see tomorrow, so whether you're still happily married or you're a single parent, don't delay. Get your personal affairs in order for the sake of your children as well as your immediate family. Don't be rude by leaving them a big mess to clean up when you leave planet earth earlier than expected! Now listen, you who say, “Today or tomorrow we will go to this or that city, spend a year there, carry on business and make money.” Why, you do not even know what will happen tomorrow. What is your life? You are a mist that appears for a little while and then vanishes. Instead, you ought to say, “If it is the Lord’s will, we will live and do this or that” (James 4:13-15). Take a financial health day!